Senate Bill 277 passed in the Maryland House of Delegates today, with the Democratic majority blocking all new amendments to the legislation. The legislation will now go to Governor O'Malley, who is no doubt giddy over achieving his long time goal of stripping Maryland drivers of their legal rights with statewide speed cameras. You can see the complete list of names on our LEGISLATIVE SCORECARD. This legislation, about to become law, will allow speed cameras to used not just in school zones but also on FREEWAYS with speed limits of "45 MPH OR GREATER" across the entire state of Maryland in "work zones" "REGARLESS OF WHETHER WORKERS ARE PRESENT," according to the text of the bill. A section of text which would have limited the placement of cameras within 250 yards of a significant drop in the speed limit was scratched just before the bill cleared the senate -- making it possible to create a situation like that in Darnestown which could entrap drivers who do not respond immediately to the change. Lawmakers who support speed cameras are fond of saying that you have nothing to fear from speed cameras if you "just obey the law". No doubt they are OK with making a statement like that with an inherent presumption of guilt, despite the fact that there have been many documented cases of innocent people receiving photo citations. EVERYONE should be afraid when our lawmakers attempt to diminish our legal rights. Do not be fooled, these lawmakers will be coming back for more and more power every year unless The People stop them. Senate Bill 277 is nothing short of a declaration of war on drivers' rights. This bill allows for calibration and maintenance logs to be submitted without corroborating witnesses. The text of the bill which reads this states that "A certificate alleging that the violation of this subtitle occurred and the requirements under subsection (b) of this section have been satisfied, sworn to, or affirmed by an agent or employee of an agency, based on inspection of recorded images produced by a speed monitoring system, shall be evidence of the facts contained in the certificate and shall be admissible in a proceeding alleging a violation under this section without the presence or testimony of the speed monitoring system operator who performed the requirements under subsection (b) of this section." This wording is actually even WORSE than the CURRENT law as implemented in Montgomery County which at requires that a "a duly authorized agent of the local police department" sign off on the violation rather than any arbitrary "AGENT OR EMPLOYEE OF AN AGENCY". Translation: citations need not be certified by a sworn law enforcement officer. The bill also redefines who the speed monitoring system operator is to be "A REPRESENTATIVE" rather than a physical operator. That means a local jurisdictions need not worry about presenting the physical operator should it be the case that doing so might risk revealing flaws in their procedures in court. This bill explicitly lowers the burden of proof for the state to "preponderance of evidence" rather than "beyond reasonable doubt" -- something which is NOT done in any of the other transportation articles related to speeding or most other traffic violations. The state certainly does not lower the standard of justice for serial killers, rapists or career criminals. There is no safety-based justification for doing it in this case either, the only reason for it is to allow the state it issue millions of citations per year without having to face large numbers of the defendants in court. The law does not provide any penalty to a local jurisdiction which chooses to not comply with restrictions in the law -- allowing them to be broken at the whim if need be to meet revenue goals. 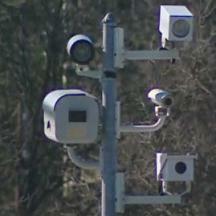 Nor are defendants permitted to raise such issues in their defense in Montgomery County speed camera cases. Judges have already gone so far as to tell defendants in court that "the only allowable "not guilty" plea against a speed camera citation is that another person was driving and to present that driver". Visitors would be well advised to avoid driving through or spending any money in Maryland if they can help it. Maryland drivers should do whatever they feel is necessary to protect themselves from this attack on their rights. Our website has turned down offers to advertise "technological solutions" to speed cameras on this site, but if our readers feel they need that kind of help to avoid accidentally "feeding the monster" they should do what they must. There are still ways to fight this thing in the courts, in the streets, and at the ballot box. Of course, it is the civic duty of anyone who receives such a citation to challenge it if they believe that the principals underlying our justice system are important, regardless of the efforts the state has gone to in order to make this appear futile. Contact Us if you want to help fight this monstrosity in other ways. Our lawmakers want you to believe that this is a "done deal" and that we, the sheeple of Maryland, can do nothing but accept the obliteration of our legal rights. They are wrong -- they have won this battle but the war has only just begun.